1. Preheat the grill to hot. Place the lamb cutlets in a bowl with 1 tbsp of the olive oil, 1 crushed garlic clove, the sumac and dried oregano. 2. Mix well so the lamb is coated and leave to marinate for at least 30 minutes. 3. Place the aubergine on a foil-lined grill pan and cook under the grill for 10 minutes turning occasionally until blackened and charred, remove from the heat and leave to cool. 4. With a stick blender purée the feta and Cayenne pepper with the yogurt. If required, loosen with a little water to the consistency of double cream. 5. Remove the aubergine stalk and place the entire vegetable, skin and all, in a blender with the tahini and lemon juice. Blitz until smooth. 6. Grill the lamb cutlets for 5 minutes each side or until crisp and cooked to your liking. 7. 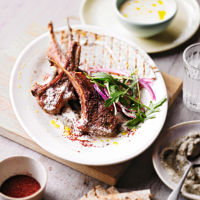 Serve the lamb with the aubergine purée, salad, the feta dressing and flatbreads.